PolitiFact is doing some great work fact-checking politicians, pundits, prognosticators and the other individuals that inhabit the Federal District. The Obameter, which tracks how successful Obama is in enacting the 500+ campaign pledges he made as a candidate, is one of my favorite features of the website. 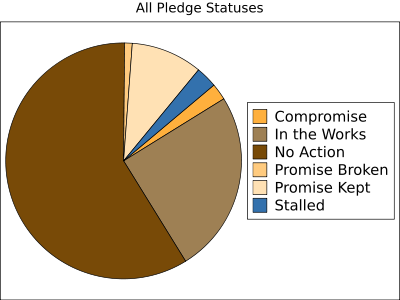 The President's track record on his 35 transparency-related pledges is unimpressive: 21 have had no progress at all, seven are in the works, three were passed but in a compromised form, two were kept and two were broken. 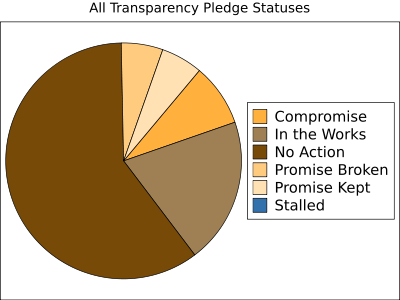 For comparison, here is a graphical representation of Obama's 480 non-transparency pledges. 283 have had no progress, 120 are "In the Works,"14 are stalled, five have been broken, 11 pledges were kept but compromised and 47 have been kept. The data clearly shows that President Obama has done a better job enacting non-transparency campaign pledges than transparency ones. He has kept more non-transparency pledges (9.79%) than transparency pledges (5.71%). He has compromised more on transparency pledges (8.57%) than non-transparency pledges (2.29%). Most disheartening, he has broken transparency pledges 5.5 times as often as non-transparency pledges (5.71% of transparency pledges are broken vs. 1.04% of regular pledges). Nine months past inauguration the excuses have run out. Obama's people are in place and they have established their routines. With 60 percent of his transparency pledges unfulfilled, Obama has shown his disdain for transparency.